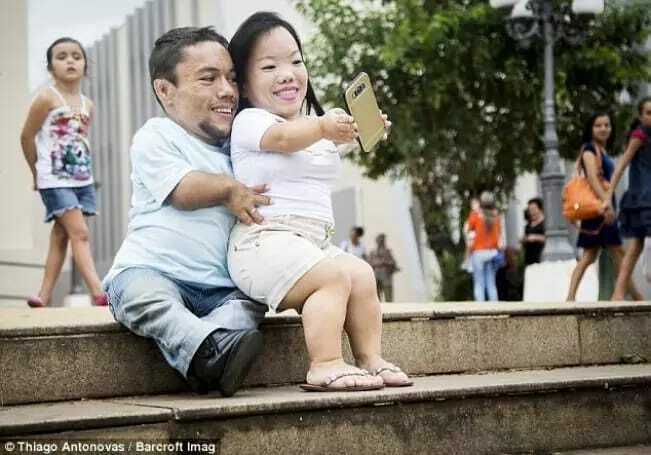 Nations Press feature news Be Inspired:The Shortest Couple on Earth. Be Inspired:The Shortest Couple on Earth. Love has no limits. It does not define sizes,heights and even gender. This girl and her boyfriend are a perfect match. Both of them barely reach 1 meter in height. The happy couple resides in Brazil. They are short but their love is for each other is immeasurable. His name is Paulo Gabriel da Silva Barros and he is 88.4 cm tall. Her name is Katyucia Hoshino and she is 89.4 cm tall. How did they meet and develop love with each other? Well, they use social media. At first they started to chat on MSN. This chatting and their love lasted for 10 years. Presently the man is already 30 and his girlfriend is 26. He took to her at once, but she blocked him from her messenger at first. Katyucia considered Paulo boring, but later on she changed her mind and got back to him. The couple aims to get into the Book of Guinness as the shortest couple in the world, the lady is a Business owner and run a beauty salon. It took only for 5 days of dating and they decide to live together after four years. “I had never dated before so Paulo is my first boyfriend, my first everything.”Katyucia said. Both of them have to overcome many difficulties of being little people in big men world.. These lovers prove once more – true love has no boundaries!